One of the nation's finest stores for men! Jasons, one of the nations finest stores for men. In 1910 Joe Alweis came from Austria to America settling in Stevensville, Montana. As he made his way west he supported himself by trading, buying, and selling soft goods. Joe subsequently ended up settling in Lewistown, Montana and opened a store called The Hub. While in Lewistown Joe and his wife Jessie were blessed with three sons, Norm, Lester, and Paul. The boys followed in their father’s footsteps and continued in the men’s retail. 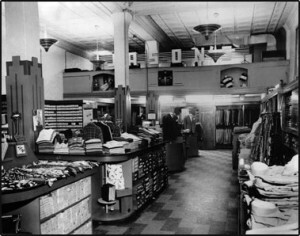 The Hub was later renamed Joe Alweis & Sons — JASONS. Through the years Lester remained in charge of the Lewistown store. There were two additional stores, one in Glasgow the other in Billings. The Glasgow location was a temporary store that was in place during the construction of Fort Peck Dam. The winter slogan was “Les & Norm will dress you warm”. In the summer it was “Norm and Les will dress you best”. 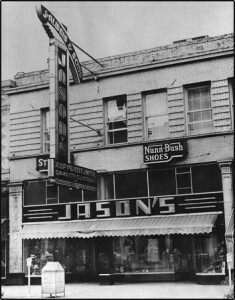 The Billings store, JASONS, came into existence in the mid 1930’s and was operated by Norm & Paul. In 1950 Norm left to pursue another clothing venture in Dallas, Texas. Lester’s son Don joined Norm in Dallas in 1962. Paul, after returning from World War II was located in Billings. Paul died as a result of an automobile accident in Italy in 1964. Les then relocated to Billings and Don joined him in 1966. Don’s son, Sheldon, became the fourth generation in the operation in 1990.JASONS continues to operate a top quality mens retail store and provides a professional staff. JASONS, offers the finest mens apparel, — price is what you pay, value is what you get.